Arlington jewelry designer Marsha White’s designs are truly unique as she uses a distinctive technique to make copper jewelry truly stand out. 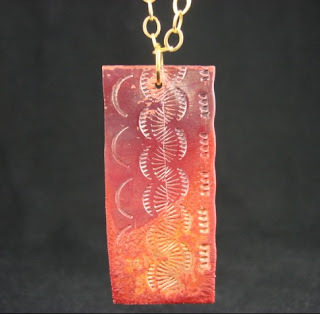 She heat-treats copper pieces to create sunset color necklaces and earrings. Because of the heating process each piece comes out differently. Also she stamps them with southwestern stamps made by Native American front used car parts. Marsha resides in Arlington, Massachusetts but her work can be seen at our gallery in Cushing Sq Belmont. Her works is really outstanding and below are some of her pieces.